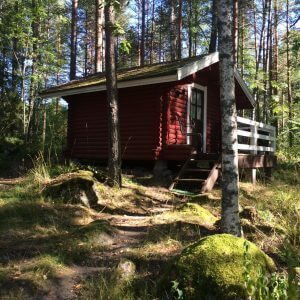 Our Lumikki cabin used to be the barn for the mill and Rantala has been reassembled from the timber of a drying bard to a cozy holiday cabin. Both cottages are unique in their own character and can be lived in all-year around. Lumikki and Rantala are located right by the Sarkavesi lake and Lumikki even has the rumbling stream running by it. Cottage Lehtola is located a bit further away from the others and offers good amenities for a simple and peaceful stay. Here you can experience a hint of everyday Finish design in close proximity to nature. In Lehtola there is no internet connection, but there is an outhouse. Lehtola can only be lived in the summer seasons. The road running through the estate is rarely busy, but can be dangerous for children or pets who are left without supervision. Small children can therefore not be left alone on the yard or the playground, which is also located close to the water. Pets are free to run wild on the forest tracks. Pets are allowed in all cottages for additional fee. If you want to conduct the final cleaning yourself, we hope that the cottage, sauna, oven, fridge and grill are clean at exit. You can also order the final cleaning service for additional fee. In the case of larger events we can offer a few additional accommodation options in the main house. Our third cabin is the summer cottage Lehtola. It is not located on the beach, but by Mouhuntie in seclusion from the other cabins. The size of the cabin is around 30 m2 and the cabin sleeps 4 people, 2 in the downstairs bedroom and two in the "attic". This cozy cabin is located on the sunny shores of Sarkavesi lake and can be rented all year around. It the bedroom sleeps two and an additional sleepers can be accommodated for on the sleeper couch in the living room space. In the summer seasons the two beds located on the small loft can be utilized when needed. Our family cabin on the shore can be rented throughout the year and it is the most spacious of our cottages (around 40 m2 on each floor). It is located between the main building and Rantala cabin, with idyllic wood fencing securing privacy for visitors. 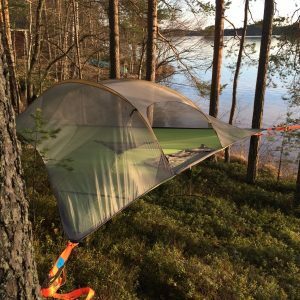 Spend a night in a tree and experience the gentle summer night like a true backpacker. Our Tentsile-tents are located by the pond, where you can observe pond life or view the clear blue skies from the comfort of a levitating tent. These small cabins are rented from May to October. They are suitable accommodation for shorter stays of trekkers and backpackers. The cabins are not located by the lake, but in the peaceful hillside of the forest. The triangle bottomed rents accommodate for 2 or 3 people per tent and are located on the Linkkumylly hill. Sleeping in these floating tents is an experience of its own. Through the gauze ceiling you can view the beautiful starry skies or the early morning sunrise. The tent comes with two ceiling options the see-through gauze and a rain proof cover. The tents will be set up for you before arrival. You can order breakfast or a breakfast basket beforehand. When accommodating the tents, you have the possibility to use the outhouses nearby and shower facilities in the garden. The old sauna can be booked for an additional fee.